From quickie Catskills car trips to far-flung Caribbean adventures, there’s a family-friendly vacation that’s right for you. Five great driving trips, from the Catskills to Cooperstown. Stone temple: The Mohonk Mountain House. What kid can resist a castle? This 250-room Victorian stone behemoth, perched on a high ridge in the Shawangunk range, overlooking a clear, sparkling lake, looks like something straight out of a fairy-tale. Long a New York families’ favorite, the all-inclusive resort offers swimming, boating, and fishing in cool, clear Lake Mohonk, hiking and horseback riding on 85 miles of well-maintained trails, plus tennis, croquet, shuffleboard, golf (on a nine-hole course), and, once you’re good and tuckered out, a spa. Kids’ Club programs, run by a well-trained staff, keep little ones entertained with age-appropriate activities such as play acting (2-to-3-year-olds), nature walks or arts-and-crafts (4 to 6), and hiking or tennis (7 to 12). Rooms are appointed with Victorian antiques (some have working fireplaces and balconies), and many have spectacular views. The dining room serves a generous buffet for breakfast and lunch and Hudson Valley–inspired dishes, such as apple-smoked duck breast, for dinner. Plenty of kid-friendly choices are available at all the meals; kids go especially nuts for the Sundae Night Special, where sweets freaks can assemble their own masterpieces. After dinner, take in a puppet show and storytelling hour, or just sit on the big wraparound porch and let the breeze from Lake Mohonk heal whatever ails you. 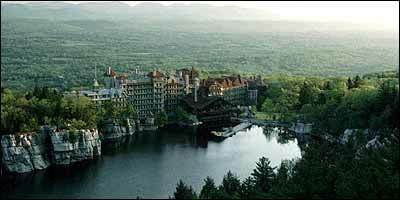 Details: The Mohonk Mountain House (800-772-6646; mohonk.com) is about a 90-minute drive from New York. Doubles start at $358 per night, all meals included. 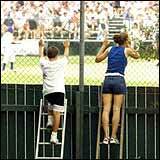 Over the fence: At Cooperstown's historic doubleday field. The National Baseball Hall of Fame in Cooperstown is more than a vacation—it’s a rite of passage for baseball-loving kids. The home-run attraction is the Hall of Fame Gallery, with its hallowed bronze plaques commemorating Babe Ruth, Willie Mays, Hammerin’ Hank Aaron, and 256 more of the game’s immortals. Among the hall’s acres of memorabilia, two must-sees for New Yorkers are the locker the Babe used in his heyday and the pitching-mound rubber Roger Clemens toed when he recorded his American League–record-breaking 3,509th strikeout. Trading-card junkies will love the Baseball Cards Room, which boasts a collection of 130,000 cards dating from 1900, and anyone who liked A League of Their Own will want to visit the exhibit on women in baseball (check out the manual describing what should be included in the All-American Girls Baseball League Beauty Kit). Just outside the hall, take in a free game at historic Doubleday Field, where local teams—from Little League to semi-pro—play daily, and a pair of pro squads face off once a year in the Hall of Fame Game, usually during induction week (in this year’s game, the Philadelphia Phillies beat the Tampa Bay Devil Rays, 7–5). The Hoffman Lane Bistro serves French-American fare, including a tasty meat loaf. For something simpler, the Doubleday Café offers kids’ favorites like grilled chicken, burgers, and hot dogs. If you plan to spend the night, the Otesaga Hotel is a stately lakefront property, dating to 1909, with elegant period furnishings and a pretty golf course. At nearby Cooperstown Fun Park, young sluggers can take cuts in the batting cage. Cross your fingers and hope it’s the start of a seven-figure-a-year career. Details: The National Baseball Hall of Fame (888-425-5633; baseballhalloffame.org) is about a four-hour drive from New York. Doubles at the Otesaga Hotel (800-348-6222) start at $355 per night. Think of the Sagamore as the antidote to Survivor. The accommodations couldn’t be more comfortable, there’s more good food than you could eat in ten TV seasons, and you can’t possibly be voted off the island. Located on a private 70-acre island in the middle of the Adirondacks’ Lake George, the massive Colonial-style resort is an all-in-one family escape. Swim, fish, and kayak in the pretty blue lake, take a spin around the island on bikes, or try a round of mini-golf (right on the grounds). The Teepee Club, for ages 4 to 12, offers horse-drawn surrey rides for the younger set and puppet making for the 9- and 10-year-olds. Mom and Dad can hit the links on the Sagamore’s Donald Ross–designed golf course (one of Golf magazine’s Top 100 Places You Can Play), swing a racket on the outdoor tennis courts, buff up at the fitness center, or wind down in the spa. Off-island, the Great Escape & Splashwater Kingdom, in the town of Lake George, offers roller coasters and water rides, while families with younger kids will enjoy the more mellow Enchanted Forest theme park, also in Lake George. The 100 restored rooms and suites in the Sagamore’s main hotel are spacious and comfortable, decorated with Colonial-style furnishings. If you prefer a homier environment, book one of the Adirondack Lodges, with separate bedrooms, living rooms, and kitchens. The Trillium, the nicest of the resort’s six restaurants, features New American cuisine, such as minted gremolata rack of lamb. For casual dinners (steaks, pasta), hit Mister Brown’s Pub. After-dinner entertainment might include a jazz trio in the Veranda Cocktail Lounge or live guitar music at Mister Brown’s. Your stay may not end with a $1 million prize, but you and your family will surely feel richer. Details: The Sagamore (800-358-3585; thesagamore.com) is about a four-hour drive from New York. Doubles start at $369 per night. 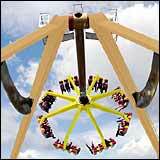 Get a grip: The Claw at Hershey Park. Willy Wonka’s got nothing on Milton Hershey. The turn-of-the-century candy baron built a real-life chocolate factory—and a whole town—every bit as sweet as the fictional one. In Hershey, Pennsylvania, the rural Central Pennsylvania hamlet about a three-hour drive from Manhattan, the smell of chocolate wafts through the air, and the streetlights are shaped like Hershey kisses. Start with a tour of Chocolate World, a simulated Hershey’s factory (tours of the real factory were stopped some years ago), where kids can see how some of their favorite candy bars are made—from cocoa bean to wrapper—and, of course, taste a sample. To burn off the kids’ sugar buzz, head to Hershey Park, where the newest of the 60-plus rides is the Claw (an eight-fingered “hand” that swings like a pendulum and spins like a whirligig at the same time). Or visit ZooAmerica, the eleven-acre walk-through animal preserve that was built to showcase Milton Hershey’s private animal collection and now houses some 75 species of critters, from alligators and bison to roadrunners and wolves. The swankest place to bunk is the Hotel Hershey, with its Mediterranean-style architecture and views of the Pennsylvania hills. The Hershey Golf Club features three eighteen-hole courses (the George Fazio–designed East Course has hosted PGA and LPGA tournaments), and the Spa at the Hotel Hershey provides the usual indulgences, plus chocolate body wraps. If you’re looking for something more affordable, the Hershey Lodge has a simple Pennsylvania Dutch feeling—and three pools. For an upscale dinner, try the Circular Dining Room at the Hotel Hershey, where the menu features contemporary American dishes such as Macadamia-crusted mahi mahi and the dining room has views of formal gardens. For simpler fare (burgers, dogs, and sandwiches), head to the Chocolate Town Café, where costumed Hershey characters (a Kiss, a Hershey Bar) work the room, and the Maximum Chocolate Overload—a chocolate brownie topped with hot fudge, whipped cream, and, of course, a Kiss—is an ideal way to put a cherry on top of your trip. Details: Call 800-HERSHEY or go to hersheypa.com for information and prices for Chocolate World, Hershey Park, ZooAmerica, the Hershey Golf Club, and the Spa at the Hotel Hershey. Doubles at the Hotel Hershey start at $329 per night. Doubles at the Hershey Lodge start at $209. Boston isn’t only for business trips on the shuttle. Our neighbor and rival to the north makes (much as we hate to admit it) an excellent family escape. The historic Freedom Trail leads kids straight back to the Revolutionary War: At the Charlestown Navy Yard and USS Constitution Museum, the tours of “Old Ironsides”—the world’s oldest commissioned warship, christened in 1797—are led by U.S. Navy sailors dressed in vintage 1812 uniforms. And at Paul Revere’s House, kids can see where the famous patriot mounted up for his historic ride. Before your kids get rebellious, try some modern fun. The Museum of Science is one of the best of its kind (check out the indoor lightning storm). For those who wish to get up-close-and-personal with sea lions, the New England Aquarium’s live animal show lets kids take the stage for a big slurpy kiss. Want to see some big sea creatures? Whale-watching excursions leave twice a day from the aquarium; sightings of a humpback, finback, or minke whale—some as large as 70 feet long, weighing 70 tons—are all but guaranteed. Even if your kids hate the Red Sox (and if they don’t, take a long look in the mirror), they’ll enjoy a game at historic Fenway Park, the Major Leagues’ oldest—and arguably its quaintest—ball yard. And historic Faneuil Hall Marketplace—once the site of Colonial independence rallies, and now a bastion of modern capitalism—offers dozens of shops and restaurants, including legendary Steve’s ice cream, one of the originators of the now-ubiquitous mix-in version of the frozen treat. The waterfront Marriott Long Wharf, near Faneuil Hall and the aquarium, is conveniently located and reasonably priced. Looking for luxury? The Four Seasons faces onto Boston’s Public Garden and includes one of the country’s most highly touted city spas. Todd English’s KingFish Hall is one of Boston’s most-buzzed-about eateries, featuring seafood specialties like rare roasted yellowfin-tuna steak, a spit-roasted seafood skewer, and a New England lobster boil. Fun, no-frills Durgin-Park, dating to 1827, serves equal parts traditional New England fare (corned beef and cabbage, Boston baked beans, Indian pudding) and crusty Yankee attitude. Be sure to tell them you’re from New York. Details: The Greater Boston Convention and Visitors Bureau (888-SEE-BOSTON; bostonusa.com) offers information on attractions, lodging, and restaurants. Doubles at the Marriott Long Wharf (617-227-0800; marriott.com) start at $179 per night. Doubles at the Four Seasons start at $295.